What's this, a baking post?? I don't bake!! Well, I had the urge yesterday. I was craving a muffin so I went in search of an easy recipe. I don't know what it is about baking - all of the precise measuring maybe? And I don't feel that I can be creative. I don't understand the role of the different ingredients - baking soda, for example - so I don't know how to make changes. And I also don't like sweets, so why bother! Creative cooking is definitely more my thing! 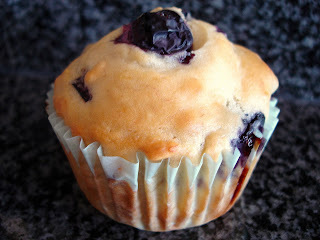 The recipe I decided on was this one for Blueberry Banana Muffins. I followed the recipe exactly..of course! Prepare 12 muffin cups with papers or generous coating of cooking spray. In a large mixing bowl, combine the flour, sugar, oats, baking powder and salt. In a separate bowl, mix together the bananas, milk, egg, oil and lemon juice. Add wet ingredients to dry ingredients and mix until just moistened. Fill each prepared muffin cup a little more than 3/4 full. Bake for about 20 minutes until golden brown. Stick a toothpick in the center of one of the muffins. If it comes out dry, the muffins are done. If there's a little batter stuck to it, you need to cook the muffins longer. This recipe noted that it would make 12 muffins, but I ended up with 16. They are good, too! For someone who doesn't bake much, your muffin came out fabulous!